Gulf Front Beauty! 22 feet to the sand. 180 degrees unobstructed beach view. Sundial Suite K303 is a beautiful 2BR/2BA plus den, third floor (2 units from elevator) beach front unit that overlooks the pristine white sand beaches of Sanibel Island. Just 22 feet to the sand. The sliding doors open wide to allow you to enjoy the unobstructed panoramic Gulf of Mexico vista from the large screened lanai and living room. All Sundial condos are privately owned. We chose to handle the rentals ourselves and that way we can save our guests money. Also, because we are in charge of the rentals, we keep improving the unit and are always on top of it's maintenance. There are only a few restrictions that you have regarding the Sundial resort when you rent through the owner and not the Sundial resort directly. You cannot use the resort pool (we have a beautiful, heated pool next to our building for your use) You cannot sit in the lounge chairs by the pool, nor can you use the workout facility. (There is a great workout facility on Sanibel that you can use for a fee) Otherwise, you're free to purchase drinks at the Tiki bar, sundries and groceries at Baileys, dining in any of the restaurants and use of the tennis and pickleball courts for a fee. All these amenities accept cash and credit cards. We rent in multiples of 7 nights beginning on Saturdays. There is a washer and dryer in the unit. We offer Free Wi-Fi, Free Bikes, Beach Chairs, Beach Umbrellas and more! CHECK REVIEWS: Luxury Suite K303 is a 5 Star unit. We have furnished and equipped K303 with every convenience to make your vacation perfect. There are 3 Flat Screen HD Cable TVs and 3 DVD players. The kitchen has all appliances, including dishwasher and microwave. All cookware and dishware are provided. There is a washer and dryer in the unit. There is central air conditioning/heat as well as ceiling fans throughout the condo. The Master Bedroom Suite has a King bed, private access to the screened lanai, large walk-in shower, and double lavs. The 2nd bedroom has 1 Queen Bed and 1 Twin bed plus its own private bath with tub and shower. The living room has a queen sleeper sofas. I'm retired from many years in the sales profession. I've personally been coming to Sanibel with my family for almost 30 years and decided I loved it so much that I had to have a piece of this island paradise called Sanibel. If you've visited here, you'll know what I mean, if it's your first visit, you'll find that just like the rest of us, you'll leave with a smile and always have Sanibel on your mind. Enjoy! Sundial building K is as close to the beach as one can get. It's just 22 feet to the sand and I knew that that is what vacationers to Sanibel wanted. My unit K303 is on the 3rd floor and offers a full panoramic view of the beach and Gulf of Mexico waters. K303 is just two condos over from the elevator and is ultra-convenient to both our beautiful beachfront heated pool and to the amenities at the Sundial resort. Sanibel has been awarded national recognition as a 'Silver City Biking' community. It's not surprising with all the miles and miles of bike trails on the island. It's a fun and healthy activity to try when you're on the island, and because we offer 3 bikes, you'll save money when you rent with us. Of course, shelling is extremely popular on the island , too. The fact that there are no stop- lights allows one to escape the hub-bub of city life. Sanibel doesn't allow fast food restaurants except the 2 that have been grandfathered in, and so you can enjoy all our unique "islandy" eateries. If you like boating, you have the chance to rent any type of boat nearby for pleasure boating, fishing, or dolphin chasing. toilet, shower, The master bathroom has a walk-in shower. toilet, combination tub/shower, The guest bath has a shower/tub combo. There is a tub/shower in the 2nd bathroom and a lovely walk-in shower in the master bedroom bath with 2 safety grips.. The master bedroom has a dual sink vanity. Our condo is within 20 feet from the white sand beach. 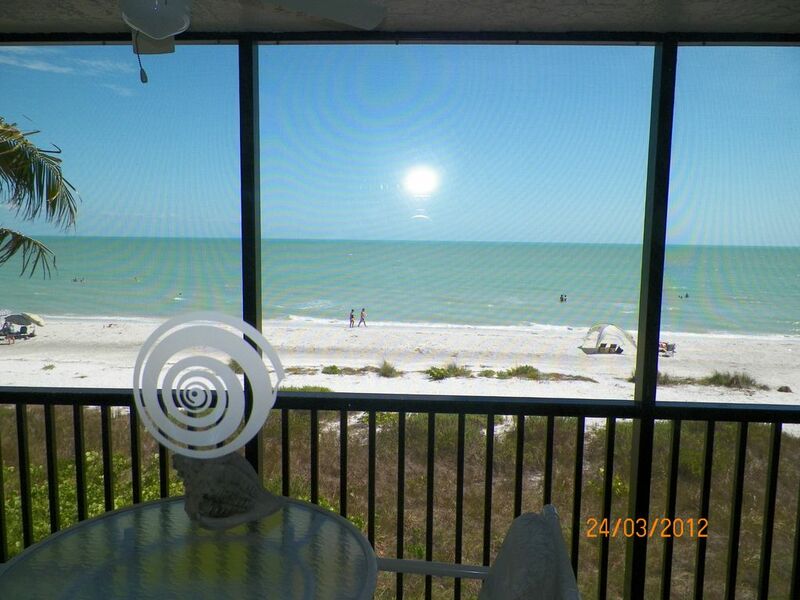 You have a full panoramic view of the Gulf of Mexico from the screened lanai. How much more relaxing and convenient can one get? No obstacles to viewing the Gulf of Mexico from our condo. You get a 180 degree view. Fully air conditioned throughout the condo. The condo has central heating throughout. However, it is usually not needed. All bedding linens provided as well as , kitchen, and bath towels. You may want to bring beach towels, since we do not provide them. Washer and dryer combo in the condo. Bath towels, wash cloths and hand towels supplied. We do not supply beach towels. Huge fitness facility available daily or weekly at the Sanibel Recreation Dept. on SanCap road about 4 miles from condo. All new furniture featuring a comfortable sleeper sofa and side chair. Full size electric range with self-cleaning oven and cooktop. There is an automatic coffeemaker. Full set of dishes and utensils as well as glassware. Our dining room looks directly out to the Gulf of Mexico and the beautiful white sand beach. Cable TV provided in Living Room and both Master and Guest Bedrooms. A small library of books is available. Plenty of puzzles, and board games for all ages are provided. There are plenty of beach toys for kids of all ages - sand toys, beach floats, tennis rackets, beach umbrellas, beach chairs and more including 3 adult bikes. We provide several 'family-friendly' videos. A great place to rent a kayak or canoe is at Tarpon Bay Nature Area which is about 3 miles from Sundial Resort. Sundial Resort also rents water equipment. We offer 3 bikes which are free for you use. You can also rent bikes nearby. There are numerous places to rent boats on the island. You can rent windsurfing boards and jet skis on the island. The Sanibel Recreation Center has 4 very nice hard courts and you can also rent a clay court at Sundial or the Dunes. Beachview Country Club is within 1/2 mile of Sundial and they offer daily fee golfing (18 holes). The Dunes Country Club is about 2 miles away and they also offers daily fee golf (18 Holes). The condo is the second over from the elevator. The master bedroom has a walk-in shower. A lovely large free heated Beach-Front pool is located within 150 feet of the condo. Sanibel Island has over 30 miles of biking/hiking trails, a variety of boating and biking rentals, and world reknown shelling on Sanibel beaches. You can walk seemingly endlessly along the white sand beaches and partake in one of the island's favorite pasttimes - shelling. Live theater is nearby as well as many wonderful restaurants. If you feel like eating in, there's a gas bbq grill just outside the condo building for your use. Tennis and golf are available. Sanibel Recreation center offers a fully equipped gym as well as a lap pool, and kiddie pool. The rec center offers daily or weekly memberships which include various aerobic, yoga and water aerobic classes. Sanibel Island has over 30 miles of walking/biking trails. Phone me at 1-630-287-0205 with any questions or if you want to book my condo. Nearby there is golf, as well as a world-reknown National Wildlife Sanctuary. Tennis & Pickleball are on-site (fee). Sanibel has wonderful Shopping, and Live Theater. Boat rental and all varieties of water sports are available nearby. Fishing and shelling excursions with captains/guides are available. World famous shelling on all Sanibel beaches. Sight seeing tram, canoe, kayak, and small fishing boat rentals are available at Tarpon Bay (Ding Darling National Wildlife Refuge) just a few miles from Sundial. There is a Shell Museum on the Island. Two thirds of the island is a wildlife refuge (tropical jungle). There are no fast food restaurants, no high rises, and no stress! ENJOY!! !